San Francisco Sep 16 (IANS) Top UN officials welcomed the outcomes of the Global Climate Action Summit that concluded here on Friday showcasing a surge of climate action and commitments from regions cities businesses investors and civil society; and calling on governments everywhere to step up their efforts to tackle climate change. Leaders from all sectors of society gathered at the event to demonstrate how they are taking ambition to the next level with a wave of fresh and brave climate action announcements that if implemented will generate over 65 million new low-carbon jobs by 2030. 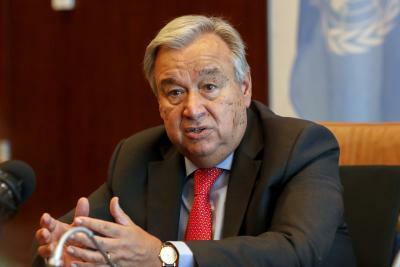 "We are experiencing huge economic losses due to climate change " said UN Secretary-General Antonio Guterres. "But the Global Climate Action Summit has brought together actors demonstrating the vast opportunity afforded by climate action. They are betting on green because they understand this is the path to prosperity and peace on a healthy planet." This momentum culminated in a landmark Call to Action which was presented to UN s Envoy on Youth Jayathma Wickramanayake in a symbolic gesture to illustrate that it is future generations who will be most affected by the decisions of the current generation to build a better more resilient world. Accepting the Summit s Call to Action on behalf of the United Nations UN Climate Change Executive Secretary Patricia Espinosa said: "This Summit and its Call to Action make an important contribution towards achieving our collective goal: to keep global temperatures to 1.5 degrees Celsius in line with the Paris Agreement." "It will encourage governments worldwide to step up their actions demonstrating the vital role that states and regions cities companies investors and civil society are playing to tackle climate change." The event took place against a background of accelerating impacts of climate change including Super Typhoon Mangkhut expected to make landfall on Saturday and Hurricane Florence which continues to devastate communities on the east coast of the US. The UN Environment highlighted the vital role of non-party stakeholders in propelling the global fight against climate change forward in an excerpt of their Emissions Gap Report launched at the Summit. "Climate change is undoubtedly the defining issue of our time and working together across nations organizations and communities is the only way that we can tackle this enormous task and seize the huge opportunities " said head of UN Environment Erik Solheim. "We have seen here over the past few days the inspiring amount of work that is already being undertaken by communities around the world to address these issues. If we manage to put our environment first we can come out on the other end of this formidable challenge and achieve our common goal a sustainable world for all." Espinosa s speech at the closing ceremony underscored the need for all actors to embrace inclusive multilateralism strongly mirroring the UN Secretary-General s remarks on Monday in New York where he called on leaders to adopt a sense of urgency to deliver a decisive response to climate change. This spirit of collaboration is in keeping with the history of San Francisco which witnessed the signing of the UN Charter in 1945 first establishing a rules-based international order that championed multilateralism over self-interest and endorsed progress not through conflict but through all people working together. Over the last three days Californian Governor Jerry Brown has played host to an official programme of events that generated more than 500 commitments. Participants used these events to unveil new commitments under five challenge areas -- healthy energy systems inclusive economic growth sustainable communities land and ocean stewardship and transformative climate investments -- captured in the Summit s final communique and registered on UN s revamped Climate Action Portal -- aimed to send a strong signal to governments to step up action by 2020 when global emissions need to peak and then swiftly decline.